The Vine Trust is an international interdenominational charity with a vision to see communities transformed. We work to bring opportunity, health and hope to disadvantaged communities and marginalised people with a particular concern for vulnerable children. We share God's love in practical ways to make a better life a reality for all regardless of race, creed, gender, colour or orientation. I have been involved with The Vine Trust since 2002. 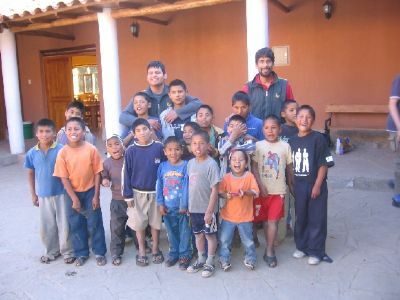 Since then I have visited Peru three times as a volunteer within SU Peru's Street Children's Project. You can read about and see photos from my latest trip below. The Drawing Room sells the 'The Fruitful Vine' recipe book for £7. Please contact us if you would like a copy. Alternatively have a look at The Vine Trust website click here. The Vine Trust's motto is Connecting People to Change Lives, and this is exactly what I experienced on my trip to Peru in July 2008. 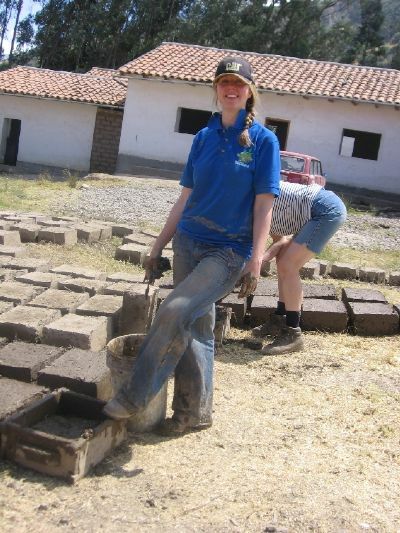 I joined a group of 25 volunteers from Scotland for an adventure to darkest Peru. Seven of the kids from my youth group at Barclay Church, Edinburgh had been keen to join a work team for years, but it was only now that they were old enough to come. So with our youngest team member just 16 years old and the oldest 65, we arrived, after 22 hours of travelling, in Lima Airport raring to go. Our enthusiasm was challenged on arrival at our ‘hotel’ at 2am to find it had a power cut; but you don’t need electricity to sleep!! A couple of hours later, we scraped ourselves out of bed to return to the airport for a short flight to Cusco, followed by a slightly longer bus journey to Urubamba the town which would be our home for the first part of our work. It is here that the newest edition to the network of Street Kids Homes was opened in March this year. An individual donor from the UK has pledged the money for the home to be built and run for five years by which time the centre should have revenue generating projects that will help with its overheads. Already there are 17 boys aged 5-13 living here along with the house parents Hector & Lucia. The main centre is beautifully finished; it is built as a quadrangle, with a courtyard in the centre and bedrooms, washrooms and a dining area all around. Our job was to prepare materials for a second building to be erected that would be used as a workshop to help raise money and train some of the older boys in woodworking. Various jobs were undertaken here. Straw has to be gathered and cut with a scythe, “just like in the olden days” as one of our young team members commented. We mixed earth, water and straw together with our feet to create the mud for the bricks. People pay good money to be covered in mud at expensive spas and in Peru it is completely free! This mixture was then shoveled into large wooden moulds and compressed to create a huge mud brick that would be baked in the sun. Dry bricks had to be stacked bearing in mind that each brick weighed 20 kilos, this was quite a workout. Who needs a gym?! The kids attend a local school in the morning and receive extra lessons in the afternoon from Hector. 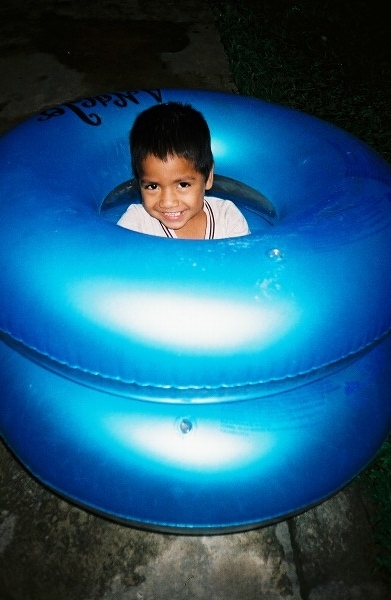 Hector explained that some of the older kids had no experience of school before they arrived at the home. They had been on the streets since the age of 3 or 4. It is so hard to imagine a 3 year old in the UK crossing a road, let alone surviving on the filthy streets of Lima, finding food, shelter and avoiding arrest and abuse. It was obvious from some of the kids’ appearance that they had been through terrible ordeals. They all bear scars all over their heads clearly visible through their hair. One boy had a scar that ran across his hairline and all the way down the side of his face, it had been coarsely stitched some time ago. Hector told us that the boys don’t like to talk about their scars or the horrors of their past as the boys believe this makes them evil and wouldn’t want Hector to think bad of them. This reflects the huge problem all the volunteers and staff who work with Street Kids in Peru. Generally within the Peruvian culture, street kids are seen as vermin, lower than dogs. They are seen as a problem as they beg, steal, prostitute themselves (in exchange for food), and it disturbs people to see them sniffing from a bag of glue (in an attempt to forget their situation). The police have been known to round up street kids and beat them or even dispose of them. So it is no wonder that the kids see themselves as less than human too. In South America religion plays a huge role in society but not always positive. The boys on the streets have been led to believe that they are not ‘good enough’ for God to love them. This also has a huge impact on their self-worth and the staff try to counteract this by constantly reminding them they are loved and cared for by both God and people they come into contact with at the centres. We also learned from staff that in some cases it is just too late, this is a heartbreaking reality. It may only be a matter of weeks since some of the 17 boys at Urubamba were on the street but these kids could smile and have fun just like our own kids at home. Any opportunity they had to play with us they would. We had taken a parachute as a gift for each centre so this especially went down well as we spent our lunchtimes and evenings losing numerous balls and beanbags onto the roof of the centre. This is also where I left the beautiful Scotland book that was gifted by Tomnacross Church. The kids and staff loved it, Hector was very inquisitive about the Loch Ness Monster, so I obviously described her appearance, eating habits and character in great detail! It was with mixed feelings we left Urubamba. We were sad about leaving the kids and the project we’d been working on but also eager to reach the project at Kusi. In 2003, I had the privilege to work on the first couple of buildings at Kusi and I returned in 2006 to witness the first handful of boys living with their house parents Angel & Rosa. As these boys had just arrived at Kusi they were quite distant and naturally wary of us ‘gringos’. I was really looking forward to returning to see how the boys had settled. Another nine hour bus journey from Lima and we arrived in the town of Yungay, just a mile outside of the town is Kusi (meaning happiness), now a home for 28 street boys as well as Angel, Rosa and their two children. It was lovely to speak with Angel and Rosa again. This centre is now a small village in itself. It lies directly under the beautiful Huascaran, the tallest mountain in Peru. It now has a cluster of buildings, dorms for the boys, family homes for staff, a school and lodges that can be rented out to climbers. The land for this project was donated by a wealthy land owner, Carmen who is a formidable character that oversees all the work. I laughed as Carmen was introduced to the group and it was explained that she doesn’t understand English. I had learnt on a previous trip that Carmen had previously a management position within HSBC bank and knew English well, she just pretended not to understand! She was committed to saving boys from the streets of Lima and creating a wonderful home for them here at Kusi. She employs builders from the area, who work alongside us amateurs. Now quite the experts we made another 800 mud bricks at Kusi. Others stripped bamboo, as this is the material used for the roofs. We also helped dig the foundations for a new dorm. Some of us chose to visit the school for a morning. I did a wee Art lesson which was lots of fun. Kusi has come along way since I was last there in 2006, I was delighted to see doors and windows in the buildings, which certainly made our room less draughty at night. They had also added paving between some of the buildings which made it feel like a real little village with it’s own streets. Kusi was our last stop before we began the long return journey and it was a real high point. Kusi really is a place of happiness. The boys here are so well adjusted after just two years. They are so affectionate, and full of mischief, always playing games and joking. The boys have a warm bed, clean clothes, three fabulous meals a day, school and best of all they are part of a family. But these are the lucky ones. No one knows just how many kids are living on the streets of Peru, on a previous trip the director of Union Biblica has said he estimated 300,000 children to be on the streets of Lima alone. So why bother to do anything, when so few can be helped? Alternatively feel free to email me mairifraser@hotmail.com or visit me at The Drawing Room, Kingsmills Road, Inverness.